In a little town called Bethany there was a home that Jesus loved to visit. It was a quiet, restful home, and Jesus knew that there was always a happy welcome for him there. It was the home of Lazarus, one of Jesus’ friends, and of his two sisters, Mary and Martha. 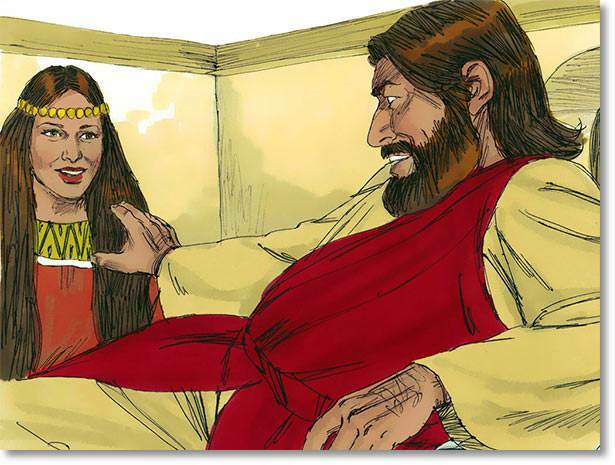 Mary and Martha kept house for their brother Lazarus, whom they loved dearly. The two sisters loved Jesus too, and they were always happy when Lazarus told them that he was bringing Jesus home with him that night for dinner. How busy they would be getting ready for such an honored guest. Martha did most of the housekeeping, so she would clean the rooms carefully. Then she would get ready for dinner the things she knew best how to cook. 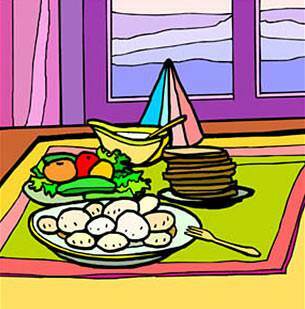 Perhaps there would be fish or roasted meat and vegetables and fruit. Perhaps Martha would bake little cakes made with honey. 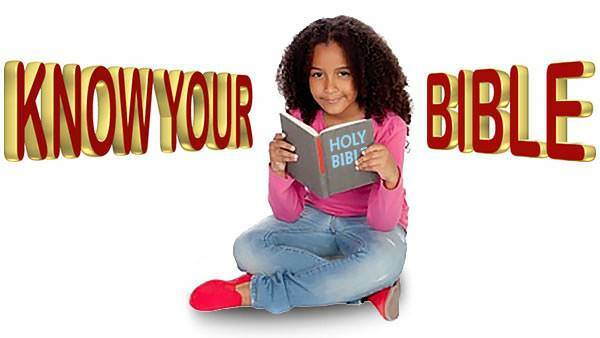 Only the very best would do for Jesus. Martha would work and work. That was how she was showing her love for Jesus. And Mary helped, too. Perhaps she thought of putting flowers around in the house where they would give Jesus a happy welcome. Perhaps she placed a jar of cool water near the door so that Jesus could have his dusty feet bathed when he came. Perhaps she remembered to place some cushions where their guest could rest comfortably. When at last Jesus came, how happy Mary was. She would come quietly in the room and sit near him where she could hear every word that he said. 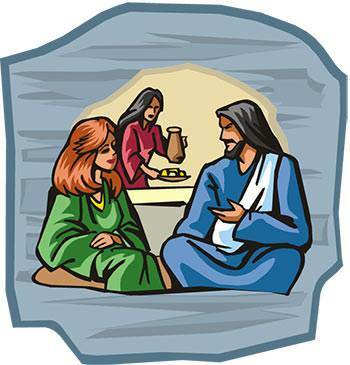 One evening Lazarus, Mary and Martha gave a supper party for Jesus. Lazarus invited Jesus. He invited Jesus’ friends and helpers, too. Martha planned what they should eat. Together the three made ready for the party. When the time came everything was ready. The house was lit and flowers were everywhere. The food was just ready to serve. 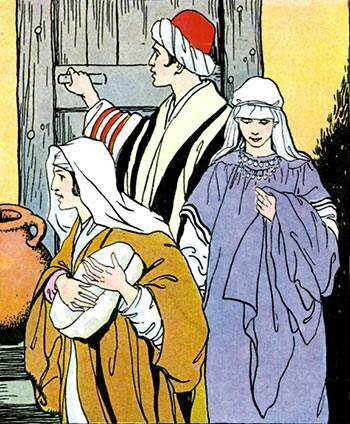 The guests arrived, and Lazarus met them at the door. He took Jesus to the place of honor at the table. Then Martha served the supper. How good everything looked and tasted. As Mary watched she thought, “I wish I could think of something I might do to make Jesus happy.” And then Mary did think of something. Quietly she slipped out of the room. She went to a chest where she kept her dearest treasures. She reached in and brought out a beautiful white bottle. The bottle was filled with costly perfume. It was so expensive that Mary never had used it. She just kept it to look at and enjoy. Mary held the bottle lovingly in her hand. Carrying the bottle carefully Mary went back to the room where the guests were eating and talking. She went close to Jesus’ place at the table. No one noticed what she was doing. And then, all at once, a strange sweet odor filled the room. The guests looked up in surprise. Where had such a sweet fragrance come from? Then they saw Mary standing beside Jesus. They saw that she had poured over him her precious perfume. It was Mary’s gift to make Jesus happy.